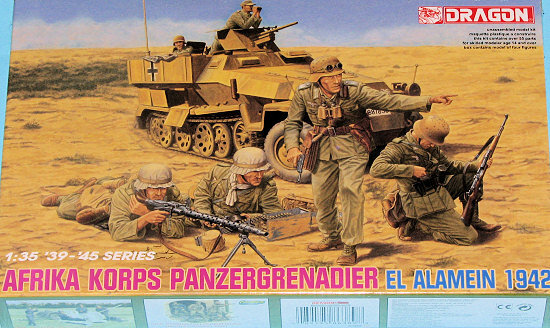 This particular set is for four figures portraying Panzergrenadier soldiers at the El Alamein battle in 1942. Included with the set are a machine gunner with helper feeding shells. A man on his knee reloading his rifle and a figure pointing towards the target. The figures are well detailed with no molding defects. Only a slight mold seam to clean up. The heads are the 'flat top' variety for the steel helmets, two of which are molded with a cloth cover. In addition to the figure sprue, there are two for weapons. One holds the machine gun (I'm guessing an MG 42) and belt while the other has the rifle that is needed for one figure. 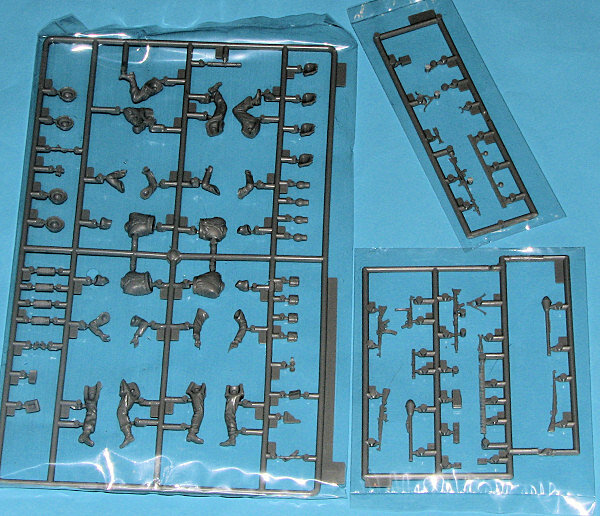 This second sprue has a bunch of other weapons that are not required for this set so you'll have a nice batch of spares. These are the 'old mold' variety without the indented barrel ends, but are still quite nicely molded. No instructions per se, but the back of the box has photo realistic illustrations showing both sides of each figure so you can determine where the various parts fit into place. A painting guide with Gunze and Model Master paints is also included. Overall, a superb set of figures for those who are in need for some Afrika Korps figures to add some interest to their next armor model or to put into a diorama all on their own. My thanks to www.dragonmodelsusa.com for the review set. You can find these either on the Dragon USA website or at your favorite hobby store.